Every piece of authentic Tucson Teepee is handmade in Tucson, Arizona. It is the heirloom quality teepee what will last for years. What is special besides handmade? No fire retard in the fabric (commonly found in commercial brand ). We use full length whole piece solid wood/ nature bamboo poles for stronger frame. We feature pattern protected anti-collapse system in the teepee. 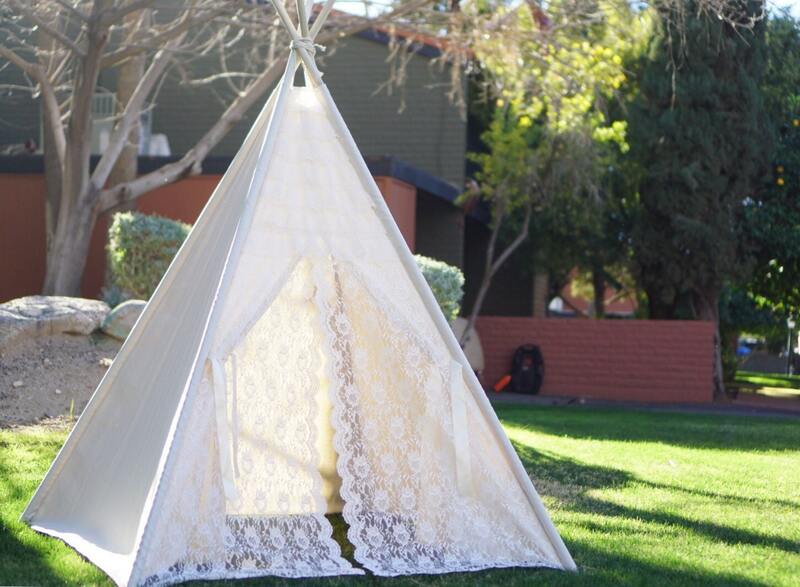 The Glamour Double Layer Lace teepee!! 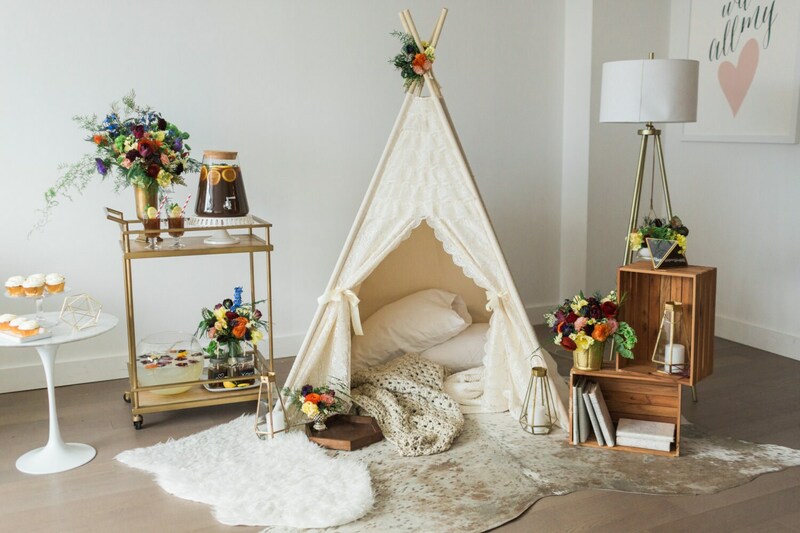 What is special about the Glamour teepee? 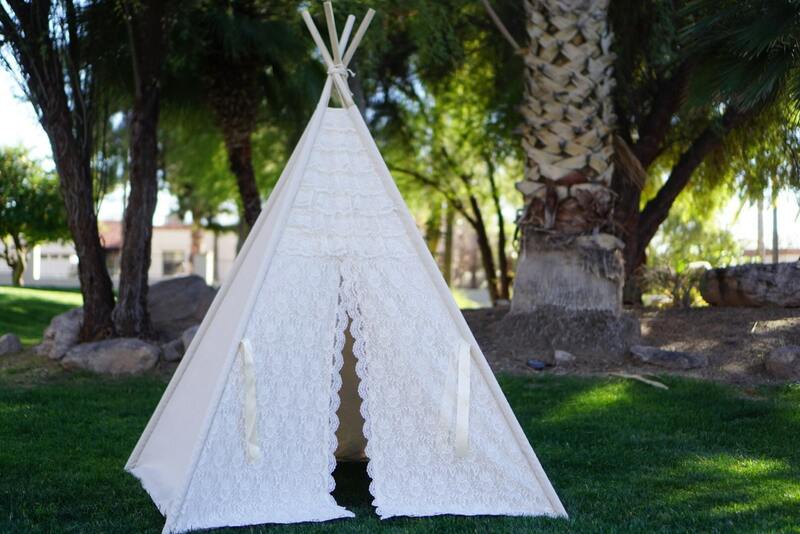 1) The lace teepee comes with two layer front door panels. The out layer use high quality lace and 7 layers of ruffle lace on the top. The inside layer use matching ivory base cotton. It presents the beauty of lace and also protects the privacy of your little one if they want some personal time. The side panels use 10 oz nature unbleached preshrunk canvas. 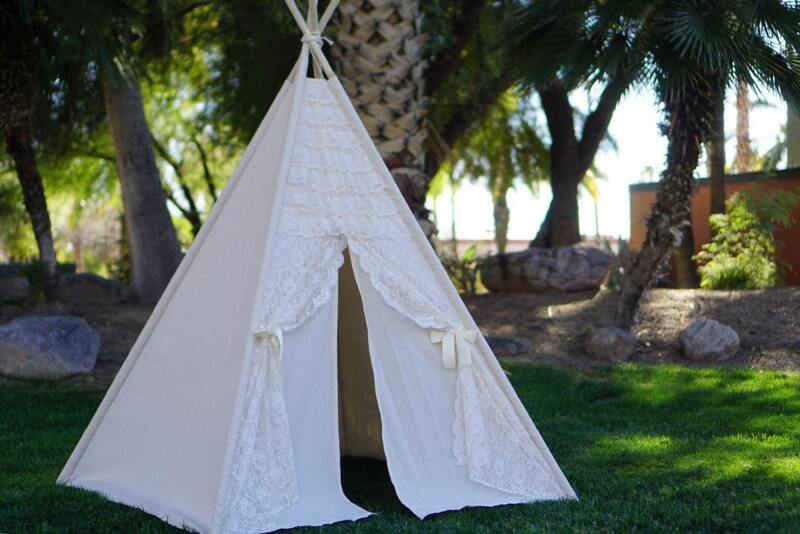 The front panel uses high quality lace fabric.Top quality fabric is selected for this classic girly teepee. 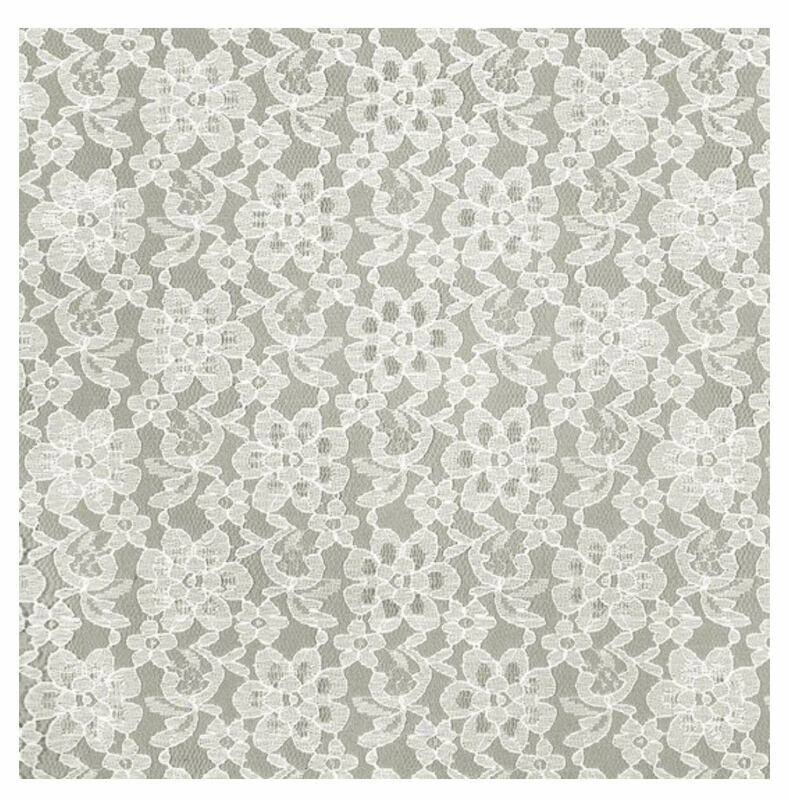 ***The lace shown in the first picture was discontinued. New lace with (as shown in the last picture) with ruffle lace trim will be used on the teepee. The base size of the teepee is 50 inches*50 inches. The base size of the teepee is 42 inches*42 inches. We have Faux fur rug in the store as well! This handmade kids tent teepee, play tent, indoor tent, wigwam, kids fort or whatever you want to call it is sure to entertain. The teepee can be used outdoor as a play tent, or indoor as a reading corner, or wherever and however you chose to use it! 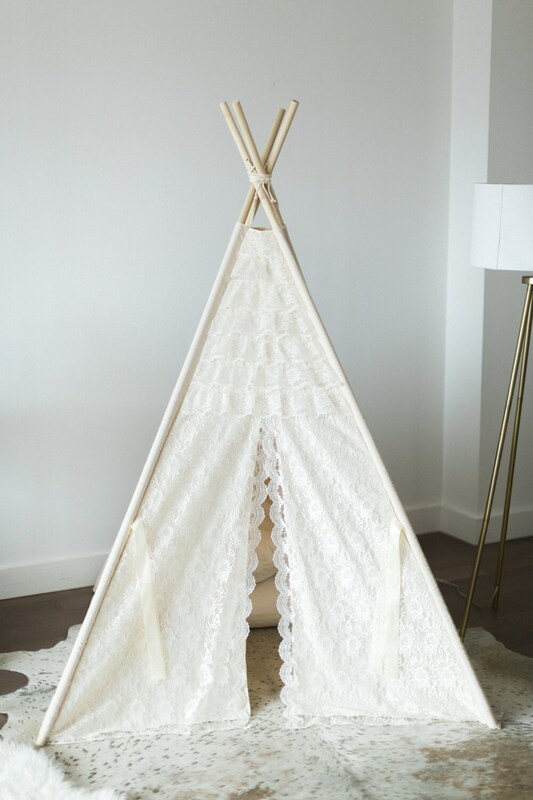 This teepee style is cute enough to give a decoration touch to any room. Your little ones will love it! •Handmade for durability using high quality fabric & nature wood or bamboo poles. •Folds up like an umbrella for easy storage in a closet or corner, or under the bed or sofa. It can be easily moved from place to place. •Set-up is quick and easy. It can be easily be taken apart and reassembled if necessary. •Can be used indoors or outdoors, but should be stored indoors when not in use. •Double stitched, including surging, providing added durability. •Spot cleaning is recommended if necessary. As the designer/creator, I retain copyright over my work. I accept the Etsy direct payment and Paypal in U.S. currency. Orders will not be started without full payment. Please Contact me if you have any issues completing checkout I can probably help. I occasionally offer coupon code discounts. Follow tucson teepee on Facebook. Any packages returned to sender due to incorrect addresses will incur a reshipment charge. ★ Overnight shipping option is available. ★ All the items shipping to Alaska/Hawaii/Puerto Rico will occur a surcharge of $20($50 surcharge for the 8ft teepee) because of the distance and USPS/FEDEX charges me more shipping fee. Please contact me before purchasing. ★ Average Shipping transit time is 2-7 business days. ★ International package transit time is around 6-10 business days. ★ If you want us to include poles for M/L/XL/XXL teepee orders outside of USA and Canada, please send us a message and we will give you new shipping quote. ★Any discount for the teepees shipped international without poles? The pole value has been deducted from the international shipping fee, so the international shipping fee listed is much cheaper than the price in the post office. I use USPS 6 to 10 days international shipping as default option. ★What is the custom fees? We can not mark the item as gift to avoid the duties because it is illegal. Any customs fees, duties, VAT, etc. are the responsibility of the buyer. Any package returned due to non payment of these fees will receive a refund. Shipping ( the actual shipping fee including the charged shipping fee and deducted part) is not refundable. ★ Provided that you contact me within 14 days of receiving the item, we would be able to provide refunds for the items that are in the condition received without wear or tear. ★Personalized items or customized orders unfortunately cannot be refunded, unless we have made a mistake with your order. ★ Sale items are not refundable. ★ Buyer is responsible for the return shipment and there will be a 15% restocking fee due to the fact that all of our items are made to order and to cover the time of assembling and packing the orders for you. ★ Original shipping fee will NOT be refunded. * For international orders which was shipped without poles, we will deduct the actual shipping fee ($75) from the refund amount for return order. If you didn’t order the correct size and wish to change to a different size, please message us for more details to see how we can help. ★There will be no restocking fee if you place the new order before sending the old one back. ★Original shipping fee will NOT be refunded. The teepees are designed for kids 3 years old and up. As with any toy, children should be supervised during use. Please note that our teepees are not designed or intended for use around open flames, fire etc. The fabric used for the teepee is all nature, without fire retardant and free of chemical hazards. The poles are nature solid ROUND dowels without any raw or shape edge to protect little fingers. 8ft teepees use nature bamboo poles. Bamboo poles may develop cracks or splits. This happens due to changes in temperature and humidity. These cracks will not affect the structural properties of bamboo and should not affect the functionality of your teepee.